I spent day four of my 2004 vacation visiting Red Rock Canyon National Conservation Area, which features a scenic drive through Red Rock Canyon. 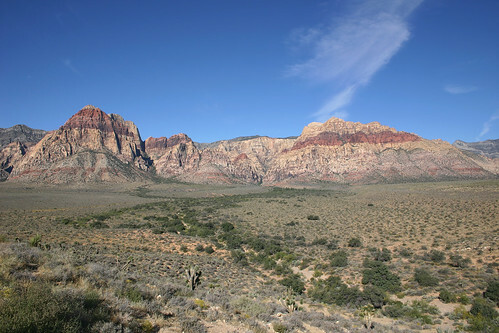 About twenty minutes away from the Strip, Red Rock Canyon is an amazing place of scenic beauty, all the more so considering how close it is to the glitz and glamor of Las Vegas. On my way down the highway towards the scenic drive, I stopped at the Red Rock Overlook to take in the awesome view. This entry was posted on March 17, 2008 at 7:29 am and filed under canyon, desert, Las Vegas, Nevada, Red Rock, Red Rock Canyon, Red Rock Canyon National Conservation Area, vacation.